From call logs, to cell tower info, to sent and received text messages, many criminal investigations involve the contents of a defendant’s cell phone. Under the Stored Communications Act, cell phone providers can provide a users cell phone data to police during an active criminal investigation with a simple court order (like a subpoena). But what about the actual content of text messages? Can the police or the prosecutor get the actual content from those text messages with the same court order? 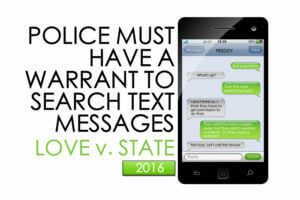 Recently, the Texas Court of Criminal Appeals considered a capital murder (death penalty) case in which the State relied on text message evidence during trial. During the trial, the state admitted (over defense objection) the contents of text messages sent and received by the defendant. The messages established the defendant’s presence at the scene of the murder and implied his direct involvement. The state leaned on this evidence during both its opening and closing statements in the case. The defendant was convicted of capital murder and sentenced to death. The appellant argued on appeal that while the Stored Communications Act allows the state to gain evidence of text messages sent and received, it does not allow the dissemination of the content of those messages. The appellant argued that the State should have obtained a search warrant backed by probable cause in order to get these records. The CCA agreed, drawing comparisons to the contents of letters sent in the mail and email stored on a server. 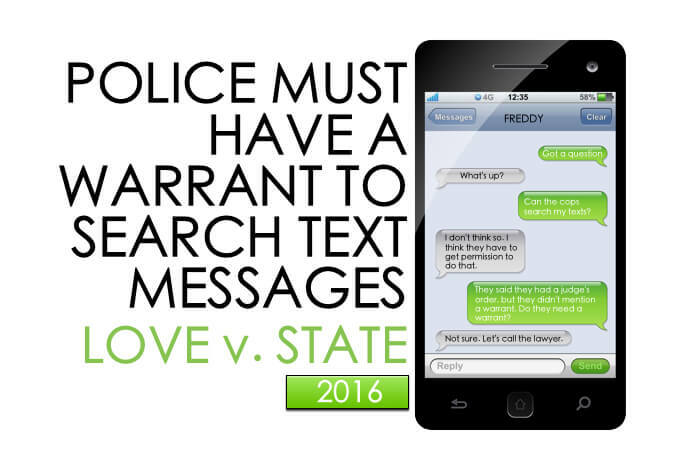 Text message enjoy the same reasonable expectation of privacy and should be protected. Many courts have treated text messages as analogous to the content of an envelope conveyed through the United States mail…Admittedly, the analogy is not a perfect one…A letter remains in its sealed envelope until it arrives at its destination, and the telephone company does not routinely record private telephone conversations. But internet and cell phone service providers do routinely store the content of emails and text messages, even if they do not necessarily take the time to read them…[E]mpirical data seem to support the proposition that society recognizes the propriety of assigning Fourth Amendment protection to the content of text messages…All of this leads us to conclude that the content of appellant’s text messages could not be obtained without a probable cause–based warrant. Text messages are analogous to regular mail and email communications. Like regular mail and email, a text message has an “outside address ‘visible’ to the third-party carriers that transmit it to its intended location, and also a package of content that the sender presumes will be read only by the intended recipient…Consequently, the State was prohibited from compelling Metro PCS to turn over appellant’s content-based communications without first obtaining a warrant supported by probable cause. Finding that “the probable impact of the improperly-admitted text messages was great,” the CCA then reversed the conviction and remanded the case back to the trial court for a new trial. TAKEAWAY: Not all records can be gained so easily through a court order. Some require a probably cause warrant. Is there a reasonable expectation of privacy in the message? It might take a new analysis as our media is changing daily, but it can be worth the fight. Note: Presiding Judge Keller dissented. She did not believe that the appellant preserved this issue for appeal. 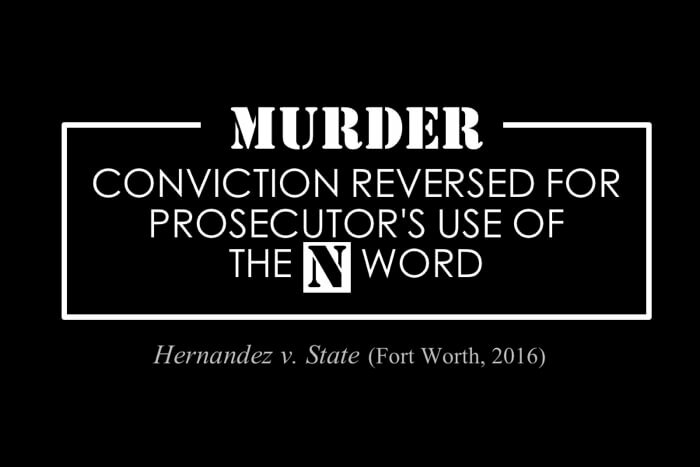 Texas Prosecutor Uses the “N” Word During Closing Argument. Court of Appeals Reverses the Conviction. The defense attorney promptly objected to the prosecutor’s use of the racial slur as it was inflammatory and outside the evidence in the case. Ultimately, (after a heated bench conference) the judge sustained the objection and instructed the jury to disregard the counsel’s comment, but did not specify which counsel or what comment the jury was to disregard. The defense did not move for a mistrial. The jury returned a verdict of guilty and sentenced Appellant to 14 years in prison. What is a Proper Jury Argument? Proper jury argument falls into one of four areas: (1) summation of the evidence; (2) reasonable deduction from the evidence; (3) an answer to the argument of opposing counsel; and (4) a plea for law enforcement. Generally, error resulting from improper jury argument is subject to a harm analysis. 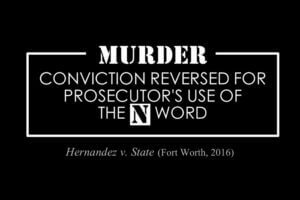 The appellate court held that not only were the prosecutor’s comments in using the “N” word error, but that the prosecutor’s comments constituted an “incurably prejudicial argument;” one that required a mistrial. Is the “Incurably Prejudicial Argument” Waived if the Defendant Does Not Move for a Mistrial? Move for a mistrial if the instruction to disregard is granted. In this case, the defense satisfied 1 and 2, but did not move for a mistrial. The appellate court was then presented with the issue of whether the improper jury argument objection is waived if the defense does not move for a mistrial. Texas precedent says the issue can be waived for failure to move for a mistrial. But the court does not find this to be wise. The court provides further reasoning to depart from precedent, citing the tenuous political atmosphere surrounding race relations in America at the time of the trial. 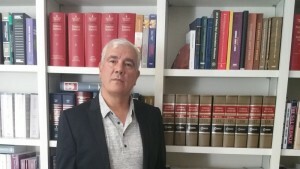 The impact of the improper statement by the prosecuting attorney must be viewed in the context of the political atmosphere at the time of trial. The trial took place in early December 2014. On February 26, 2012, George Zimmerman, whose mother was from Peru, killed Trayvon Martin. Emotional discussions of Zimmerman’s ethnicity filled news commentary. Other killings made headlines. Among them was the death of Eric Garner while he was selling loose cigarettes in New York on July 17, 2014. The officer who killed him was Daniel Pantaleo. On August 9, 2014, Michael Brown was killed in Ferguson, Missouri. On August 11, 2014, Ezell Ford was killed in Los Angeles by two police officers, one of whom was Hispanic. And on November 23, 2014, twelve-year-old Tamir Rice was killed in Cincinnati, Ohio. Additionally, the Black Lives Matter organization was formed in 2013 in response to the acquittal of George Zimmerman in his trial for the murder of Trayvon Martin and was actively involved in protests nationwide. With that, the Second Court held that the improper jury argument was not cured (and could not have been cured) by the judge’s “perfunctory” instruction to disregard and that the error was preserved for appeal. The court then reversed the case and remanded back to the trial court. Of all of the words in modern American English usage, including the slang and the vulgar, the “n-word” is of such infamy that it is generally referenced and understood only by its first letter. And with very few exceptions, such racially charged inflammatory language has no place in jury argument. This is certainly the case when a prosecutor, using that language to secure a conviction, goes outside of the record to introduce it. Therefore, I agree with the majority that the prosecutor’s behavior was improper. It was inexcusable. It cannot be condoned. And the trial judge committed error in permitting it. Nevertheless, because we are constrained by precedent of the court of criminal appeals requiring preservation of this type of error, I am compelled to dissent. It will be interesting to see whether the Court of Criminal Appeals will stick to their previous precedent or take this opportunity to change the law when it comes to an “incurably prejudicial argument” involving racial slurs. 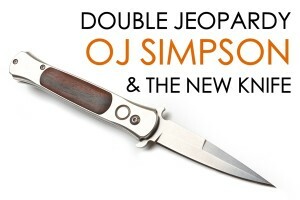 Many of you have heard of the new development in the OJ Simpson case, the discovery of a knife that was found on Simpson’s property sometime around 2002 or 2003 (interesting that this is coming to light during the airing of the OJ Simpson TV drama on FX). A construction worker, who gave the knife to a former LAPD officer that was working as a security officer, reportedly uncovered the knife on or around Simpson’s property. For reasons that are unclear, the knife was just recently turned over to LAPD in early March. 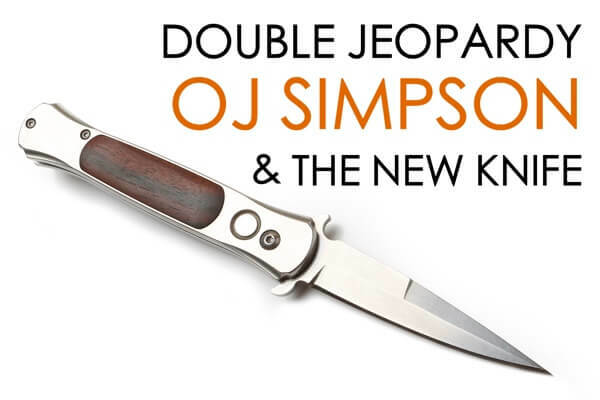 This is big news because the knife used in the murders of OJ’s wife, Nicole Simpson and her friend, Ron Goldman, was never found and Simpson was ultimately acquitted in 1995 for their murders. So what does this discovery mean for OJ Simpson and the murder charges that of which he was acquitted back in 1995? LAPD is testing the knife for DNA and hair, and it has been unofficially reported that no DNA exists, but if they find something, what can they do? Can Simpson be retried for the murder of his wife and her friend? No, he cannot be retried. Jeopardy has attached and Simpson is protected from being retried on the same offense after being acquitted. The 5th Amendment of the United State’s Constitution provides that no person shall be “subject for the same offense to be twice put in jeopardy of life or limb.” In other words, a person shall not be put on trial for the same offense after receiving a not guilty verdict. This is commonly known as the protection again Double Jeopardy. Further, the Doctrine of Res Judicata (claims preclusion) bars relitigation of a claim that has been validly and finally adjudicated. Because OJ Simpson was acquitted for the murder of his wife and her friend, this means that he is protected by the Constitution from Double Jeopardy and cannot be taken to trial for their murders again even if new “evidence” is discovered. This answer would not change even if DNA evidence came back showing a link to one of the victims. Further, under the Doctrine of Res Judicata, since there was a valid and final judgment in regards to the guilt of Simpson in these murders, the State of California is barred from reopening Simpson’s case. Is there any way around Double Jeopardy? The only way around double jeopardy is to be federally indicted for some other offense arising from the same events. The state and federal authorities are separate sovereigns. Here, it would not be a Double Jeopardy violation for Simpson to receive a federal indictment for violation of the victims’ civil rights, but it would be incredibly unlikely. Takeaway: If you have already been found not guilty for an criminal charge, the 5th Amendment and Doctrine of Res Judicata protect you from being brought to trial on that same charge. Was it an Unlawful Warrantless Search Under the 4th Amendment for the DA to Obtain Cell Tower Records From a Third Party and Use Them Against a Defendant Charged with Murder? J on Ford and Dana Edwards dated off and on for two years in the small town of Alamo Heights, Texas. After a long break-up, the former couple saw each other at a friend’s New Year’s Eve party. The group of friends drank heavily and played “Apples to Apples,” an interactive game that required the participants to reveal their thoughts on personal topics. During the game, the subject of marriage came up and Ford was singled out about his on-again-off-again relationship with Edwards. Angry, Ford left the party before everyone else. The next day, Edwards’s parents were expecting her in Fredericksburg, but she never showed. Worried, her parents drove to her condo, where they found her dead. Because she sustained lacerations and trauma to her head, the police opened up a murder investigation. On January 2nd, Ford volunteered to give a statement. In his statement, Ford said he left the party around 11:30 pm, went home, and fell asleep. Ford said that his new cell phone had been in his possession the entire night. The investigators obtained video footage of the streets bordering Edwards’s condo, footage that conflicted with Ford’s official statement. At 11:24 pm, the camera captured a white SUV, similar to Ford’s vehicle, turn into the victim’s condo complex. At 1:00 am, Edwards’s car entered the complex. At 3:16 am, with the headlamps turned off, the white SUV exited the complex. No one could definitively say the white SUV belonged to Ford, as the license plate and registration stickers could not be determined because of the quality of the video. A week later, the San Antonio District Attorney’s Office filed an application under Article 18.21 § 5(a) of the Texas Code of Criminal Procedure, and in compliance with Communications Act, to obtain Ford’s historical cell-site-location records from AT&T Wireless. At trial, a radio network engineer from AT&T Wireless testified about the records. The engineer said that AT&T can tell where a cell phone is located by examining the sector information. He explained, “when a person sets up a call, receives a call, or sends a text, the person does so in communication with…sectors in the cell-phone network…[which] enables [AT&T] to look up the records for a particular phone number…determin[ing] [the] cell phone’s proximity to a cell…tower.” Ford v. State, 444 S.W.3d 171, 190 (Tex. App.—San Antonio 2014). This is also true when the phone is not being actively used, as “unanswered texts and calls…automatic downloads….cause the [phone] to…ping the network to alert the network that the [phone] is in a particular…area.” Id. According to AT&T, Ford’s cell records indicate that the numerous pings place Ford at the party, then at the victim’s condo complex and finally, at his home. The “ping” time frame also matches the timestamps from the camera footage for the unknown white SUV. Id. The jury found Ford guilty of murder, sentencing him to forty years in prison. Ford appealed, and the court of appeals affirmed the verdict and sentence, relying upon the third party doctrine. Justice Chapa dissented in the court of appeals case, stating, in a nutshell, that Ford retained a reasonable expectation of privacy in his physical movements and location; he did not voluntarily surrender his expectation of privacy; and because the State did not secure a warrant before obtaining the records, Ford’s Fourth Amendment rights were violated. Ford appealed to the Criminal Court of Appeals (“CCA”). 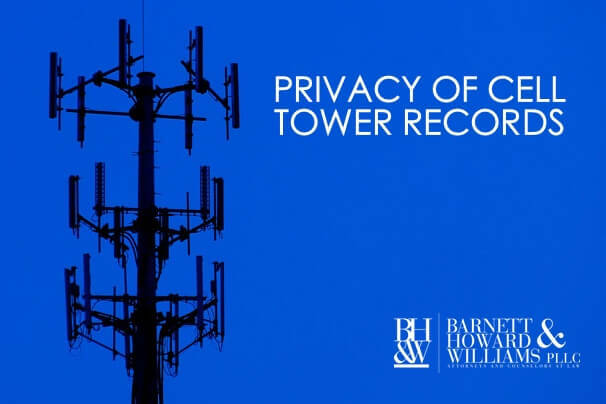 Did the State of Texas’ warrantless acquisition of historical cell-site-location information—recorded by a 3rd party cell-phone service provider—violate the Fourth Amendment? Did Ford have a reasonable expectation of privacy in his movements and location? What does the law say about the expectation of privacy in cell phone records? What is the Third Party Doctrine? The Fourth Amendment Guarantees , “the right of the people to be secure in their persons, houses, papers, and effects, against unreasonable searches and seizures.” U.S. CONST. amend. IV. A person may appeal a verdict under a privacy theory if (1) he has a subjective expectation of privacy in the place or object searched, and (2) society…recognize[s] that expectation as reasonable. State v. Granville, 423 S.W.3d, 399, 405 (Tex. Crim. App. 2014). The Third Party Doctrine allows for acquisition of information revealed to a third party (such as a cell phone company or a bank). Case law reflecting this doctrine suggests that information that must be disclosed [in the normal course of business] for the phone company to provide the requested service, is not off-limits to law enforcement and is not a violation of the Fourth Amendment. However, courts across the United States remain divided on this issue. What could Ford v. State mean for you? Generally speaking, your cell phone records, by way of the third-party doctrine, are subject to review by law enforcement and could be used against you in criminal proceedings in Texas. The CCA is saying that a reasonable person does not have a reasonable expectation of privacy in his or her cell tower records. 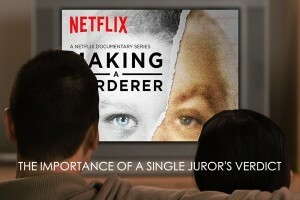 Can a Single Juror Make a Difference? Ask Steven Avery. 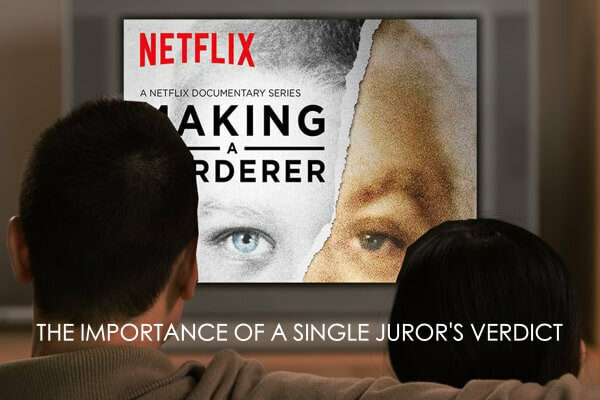 We, like many of you, have been sucked into the sad, frustrating, and very real tale of the murder trial of Steven Avery in Manitowoc County, Wisconsin brought forth in the Netflix documentary “Making a Murderer.” While much has been made of Steven Avery’s guilt or innocence, the coerced confession from his nephew Brandon Dassey (see full confession transcript HERE), and the possible foul play of the law enforcement in Manitowoc County, one major key to the case has been largely overlooked – the power of the jury. Without a guilty verdict from the jury, there is no frenzy over a viral documentary and certainly Steven Avery is a free man. Recently, the filmmakers have reported to the press that a member of the jury now admits that he or she believed Avery was not guilty. This juror, wishing to remain anonymous, claims to have changed their vote to “guilty” after succumbing to fear and pressure. In reality, the juror believed, and still believes, that Avery was framed for murder. Speaking to the filmmakers, the juror said “I’m the reason the justice system failed.” Is the juror right? Criminal Verdicts in Texas Must Be Unanimous. Every Juror Vote Counts. Jury deliberations are secret, so only the jurors themselves could ever say for sure exactly why they arrive at a certain verdict for a case. In a criminal case, a jury verdict must be unanimous, which ensures that each juror’s vote is important and not diluted in a simple majority. If this one juror had summoned the courage to stay true to their “not guilty” vote, it would have caused a mistrial. A mistrial forces authorities to make the difficult decision of whether or not to retry the accused. Who knows what would have happened in a hypothetical second trial of Steven Avery. For years, this juror has shouldered guilt from this trial, proving that the decisions juries are asked to make are indeed difficult ones. The next time you are on a jury, take a lesson from this case. Stand up for what you believe in and refuse to cave to pressure or fear. Do not be overpowered by the person with the loudest voice in the jury room. Remember, your vote holds the power of incarceration or freedom. I hope we didn’t spoil the documentary for you, but if you haven’t watched it, this post does not even scratch the surface of the things you will see in this series. We suggest you watch it and consider the case for yourself. If nothing else, you’ll see that there are two sides to every story and you’ll understand to importance of having a fair and conscientious jury in a criminal trial. A person commits and offense if he intends to cause serious bodily injury and commits an act clearly dangerous to human life that causes the death of an individual. Because there is no clear mens rea (i.e. culpable state of mind, such as intentionally or knowingly) required under 19.02(b)(2), Texas courts have not allowed a lesser-included instruction on the offense of Manslaughter (which required a mens rea of recklessness). In Cavazos v. State, the Texas Court of Criminal Appeals held that Manslaughter is an LIO of Murder under 19.02(b)(2). While the CCA could not look to the specific elements of the offenses to come to a conclusion, it used a functional equivalence test, holding that the culpable mental state for Murder under 19.02(b)(2) is the intent to cause serious bodily injury, which can be substituted for recklessness under a Manslaughter theory. Of course, Mr. Cavazos did not benefit from this holding, because the CCA also held that his particular case did not qualify for the LIO instruction. So while new law emerges, his conviction stands. Under Chapter 9 of the Texas Penal Code, self-defense is provided as a justification to the offense of murder (among others). Chapter 9 makes clear that if a fact-finder believes a defendant’s actions are justified, the fact-finder may not convict for an offense based on those self-defense actions. 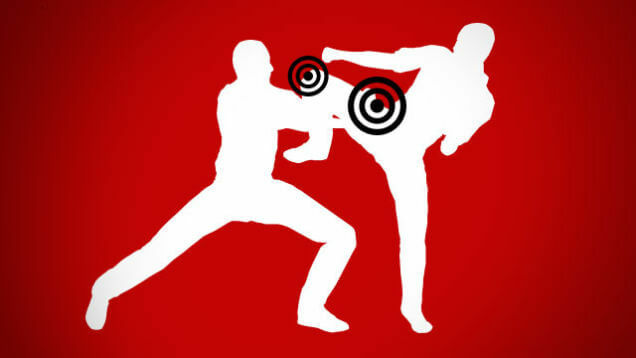 In essence, a defendant that pleads self-defense is telling the fact-finder that he intentionally performed certain actions in order to protect himself against the unlawful actions of another. So…if the defendant intentionally performed the self-defensive actions, can self-defense be applied to an offense like manslaughter that requires “reckless” conduct vice intentional? In Alonzo v. State, the 13th District Court of Appeals (Corpus Christie) “believed it is illogical for a defendant to argue self-defense when charged with an offense whose requisite mental state is recklessness.” The Texas Court of Criminal Appeals, however, disagrees, explaining that “there is nothing in Penal Code Section 2.03 or Chapter 9 that limits justification defenses to intentional or knowing crimes, nor do we have a reason to infer such a limitation.” The CCA notes that limiting self-defense to only intentional or knowing crimes could encourage prosecutors to charge manslaughter (a reckless offense) vice murder when there is a self-defense issue, because self-defense would be inapplicable. Judge Womack explains that “by arguing self-defense, a defendant is arguing that his actions were justified, and therefore he did not act recklessly.” So really, it’s just another way to disprove the charged offense. Of course, a defendant cannot argue self-defense in the face of a murder charge and then at the same time request a lesser-included instruction on manslaughter. The CCA made sure not to disrupt prior caselaw holding such. But the overarching takeaway from Alonzo is that a defendant that is acquitted of a murder charged based on self-defense CANNOT be convicted of the LIO of manslaughter. Back in June of this year the Texas Court of Criminal Appeals addressed a case involving a conflict of interest. Criminal defense attorneys will find that conflict issues come up frequently. The writ of mandamus that the CCA heard in this case addresses conflicts of interest and provides some assurance as to what attorney’s can do to shore up any issues they may have with conflicts. In Bowen v. State, a writ of mandamus was filed by a defense attorney representing a client on trial for Capital Murder. A principal witness in the case against his client was a jailhouse informant who happened to also be a former client of the defense attorney. The State moved to disqualify the attorney arguing that his ability to cross-examine his former client would be hampered because of the past representation. At a hearing on the State’s motion to disqualify, the attorney introduced into the record signed written waivers from both his client on trial for capital murder and the witness whom he formally represented. The trial court granted the State’s motion to disqualify the attorney. The Court primarily looked to the Sixth Amendment as addressed by the Supreme Court in Wheat v. United States, 486 U.S. 153 (1988). In Wheat, the Court emphasized the question of whether or not an actual conflict exists. The Court held that trial courts must, “recognize a presumption in favor of [a defendant’s] counsel of choice, but that presumption may be overcome not only by a demonstration of actual conflict but by a showing of a serious potential for conflict.” Id. at 164. In absence of an actual conflict, the court gives great weight to a waiver. The Court in the Bowen case held that the decision to disqualify the attorney was a clear interference with the defendant’s Sixth Amendment right to counsel and that there had been no evidence of the existence of an actual conflict. Ultimately, the Court held that the waiver that had been signed was sufficient in this case to preclude disqualification of the attorney. It is a “must” in the defense world to obtain waivers when facing potential conflicts of interest. Even in a Capital Murder case, a waiver can be effective to disclaim the conflict. This case does not make waivers the “end-all, be-all,” but it does show the legal world that the court will give great deference to waivers and a defendant’s Sixth Amendment right to the counsel of their choice. In 1999, Neal Robbins was convicted of capital murder and sentenced to life in prison for the death of his girlfriend’s 17 month-old child. 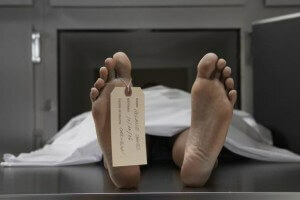 The cause of death as reported by the medical examiner was asphyxiation by compression. The medical examiner testified to her theory at trial and despite contrary evidence that the compression wounds may have resulted from adult administered CPR, the jury convicted Robbins of capital murder. I believe that there are unanswered questions as to why the child died, and I still feel that this is a suspicious death of a young child. Given my review of all the material from the case file and having had more experience in the field of forensic pathology, I now feel that an opinion for a cause and manner of death of “undetermined” is best for this case. She went on to explain that the bruises she originally equated with asphyxiation by compression could have resulted from aggressive CPR and other efforts to assist the child. Armed with the recantation of the chief government witness, Robbins filed an application for writ of habeas corpus in June of 2007. The State did not oppose the application and recommended that Robbins be given a new trial “because his due process rights to a fair trial and impartial jury were violated.” In response, the trial court appointed yet another medical to review the evidence and offer an opinion. This time, the chairman of the Department of Pathology at Baylor College of Medicine opined that the original determination of the cause of death, as presented in the capital trial, could not be supported by the evidence. Not satisfied with this opinion, the trial court ordered one last review by another pathologist. This last and final pathologist stated that it was her opinion that the child’s death was a homicide and that the manner of death was asphyxia by suffocation (a theory not presented at the original trial). After this finding, the State withdrew its recommendation that a new trial be granted, but agreed not to oppose the request for a new trial. After an evidentiary hearing into the cause of the child’s death, the trial court recommended that the Texas Court of Criminal Appeals grant Robbins’s request for a new trial. [The original medical examiner] did not entirely repudiate her testimony. Although she can no longer stand by her more definite trial testimony, it remains at least possible that [the child’s] death could have occurred as [the medical examiner] originally testified. Thus, [her] re-evaluation does not void her trial testimony. The jury could have considered [her] “undetermined” opinion and still found Applicant guilty, especially in light of all of the other evidence adduced at trial. Applicant has, therefore, failed to make the requisite showing “by clear and convincing evidence that no reasonable juror would have convicted him in light of” [the medical examiner’s] re-evaluation. Application for writ of habeas corpus is denied. If only Robbins had been tried in Florida by Casey Anthony’s jury, this entire appeal could have been averted.